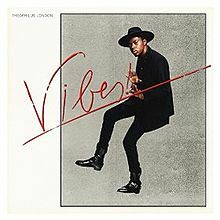 I’m not sure where Theophilus London came from, or how he made it to the top so quickly, but I was intrigued as to why he’s raved about so much, and why I keep seeing his name splashed across the internet. Born in Trinidad & Tobago, the 27-year-old emcee resides in Brooklyn, New York and Vibes is his second studio album, following four mixtapes and two EPs- maybe that’s where he came from. First impressions- well you can see from the off just why Kanye rates Theophilus London so highly- he pretty much is Kid Cudi. The dark warped aesthetic to Cudi is omnipresent across Vibes and the two sound so similar that at points I genuinely forgot I was listening to somebody ‘new’. I’ve written new in quotation marks because Vibes doesn’t really offer anything new- Cudi’s already done it, and better. As you may have worked out- I’m a big-time Cudi fan, so once I got my head around the fact that Theophilus London is literally a carbon copy, I could begin to appreciate Vibes as the separate entity is was intended, although if I’m honest, this took me a while. Back to the album, it’s not as one-dimentional as I’d initially thought- let’s take the break-beat-esque, house-inspired Heartbreaker, compared with the Kanye-featured Can’t Stop, two incredibly varied pieces of music, yet work really well side-by-side on Vibes. Theophilus’ flow also reminds me of ScHoolboy Q and Jay Electronica’s on the latter, at which point I’d completely forgotten about the Kid Cudi comparisons. In summary, Vibes was a decent listen. The album has its gems (Need Somebody sounds like Gorillaz and Frank Ocean made a track) as well as some clangers- Take and Look. I still think Theophilus London needs work on what he’s all about, blips of Yeezus-ish production and Cudi-emulating vocals don’t reflect well on London in my eyes, and maybe doesn’t give him the credit he deserves, but generally, Vibes is still a pretty good sophomore.